The number of jobs in rural America increased in the last year, but rural counties remain well below their pre-recession employment level. Ten years after the beginning of the great economic depression in December 2007, rural America still hasn’t recovered. Rural counties count 770,000 fewer jobs in October 2017 than they had in 2007, according to the Bureau of Labor Statistics. 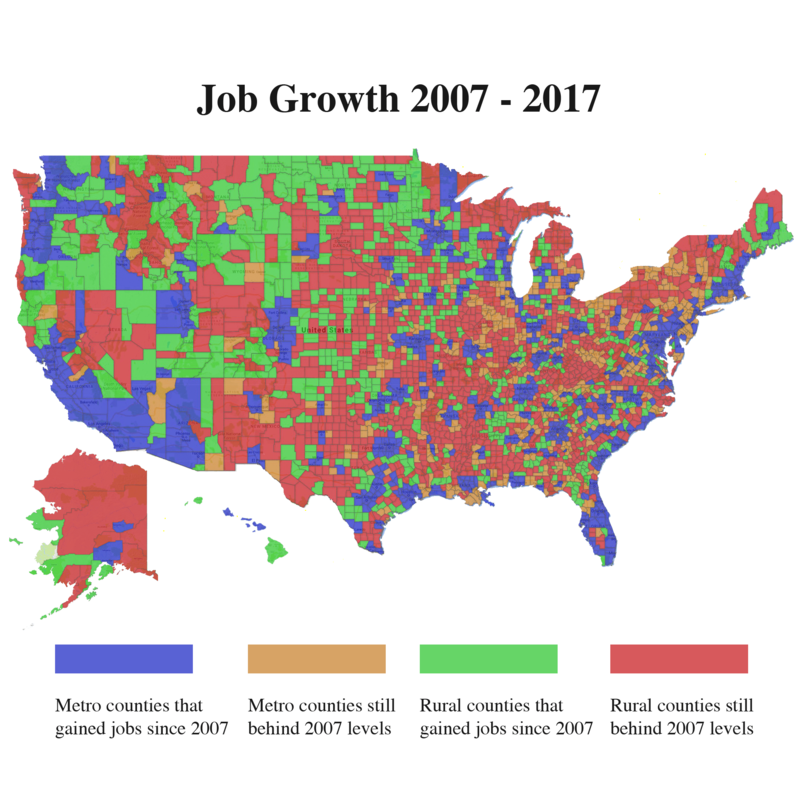 A comparison of the geography of jobs in 2007 and October 2017 reveals how unequal the recovery has been. The map above shows whether counties have more or fewer jobs today compared to 2007. Blue counties are in metropolitan areas and have gained jobs in the last ten years. Orange counties are metro areas that have yet to get back to the employment levels before the recession began. Cities have done much better than rural areas in recovering from the recession, which officially began in December 2007 and ended in June 2009. Only 40 percent of urban counties have fewer jobs now than in 2007. In rural America, however, two-thirds of the counties had fewer jobs in October than in 2007. Job growth has been particularly concentrated in the nation’s largest metropolitan areas. There are just over 9 million more jobs in the U.S. now than in 2007, but 87.5 percent of that gain has been in urban areas of a million or more people. The ten counties with the largest gains added just over 2.1 million jobs. Those counties included Harris, Tarrant, Dallas, Bexar and Travis in Texas; Los Angeles, Santa Clara and Riverside in California; Maricopa in Arizona and Kings County in New York City. Rural counties, meanwhile, lost 770,000 jobs. Pike County, in Kentucky’s coal country, lost over 5,000 jobs. Chautauqua County in New York has lost over 11,600 jobs since 2007. Unemployment rates in rural and urban America were low in October of this year, averaging at or below four percent. Those rates are lower than in 2007, when unemployment rates were at or above 4.5 percent. Rural unemployment rates have dropped, however, not because there are more jobs, but because the total workforce has shrunk. Since 2007, the total number of people working or looking for a job in rural counties has dropped by nearly 1.1 million people. In the last year, the number of jobs has increased in rural counties. From October 2016 to October of this year, the number of jobs in rural counties has increased by fewer than 200,000. Still, however, job growth rates in cities of a million or more in the last year are twice what they are in rural America as a whole. And the workforce in rural America continued to decline (by 27,000 people) in the last year.